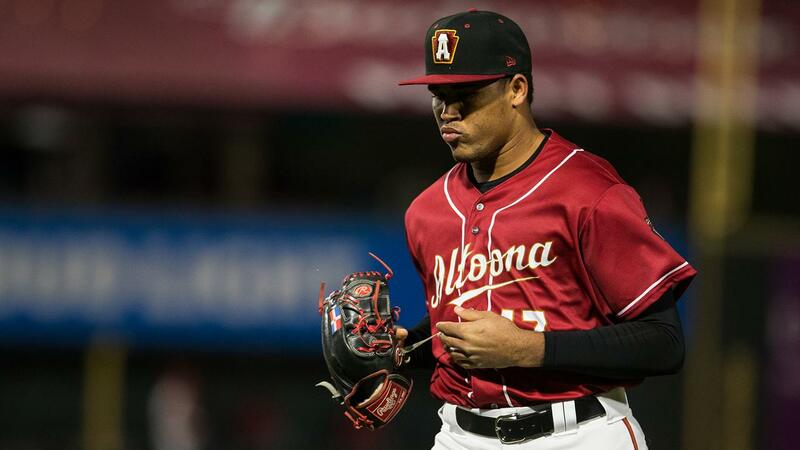 ERIE, Pa. - Solo homers by Bligh Madris and Logan Hill paired with strong mound appearances by Pedro Vasquez and Yeudy Garcia led the Altoona Curve to a 6-3 win over the Erie SeaWolves at UPMC Park on Monday. The Curve (5-0) win matchs a team record set by the 2006 club for the longest winning streak to start a season while the SeaWolves (2-2) were held to one run through eight innings after plating 29 runs in their previous three games. After three hits on Sunday, Hill paced the offense with a 4-for-5 showing and drove in runs during the eighth and ninth innings. Hill launched his first homer of the year in the eighth and connected on his second double of the contest to put the Curve ahead, 6-1, in the ninth. Trailing 1-0 after three frames, Madris started the fourth and tied the games with his first Double-A homer to right-center. The Curve took the lead for good with four total scores in the inning. After hits by Hill and Hunter Owen , Jason Delay drove in the go-ahead run on an infield hit. Robbie Glendinning brought in Owen with a sacrifice fly before Brett Pope roped a single to right to bring in one more and cap the four-run rally. Pedro Vasquez (Win, 1-0) held Erie to one run in the second inning against as Daniel Pinero hit a lead-off double and was knocked in with two outs on a two-bagger by Jose Azocar. The righty fanned four batters and gave up five hits without issuing a walk. Now through 26.2 innings pitched, Curve starting pitchers have issued just one walk after their first trip through the rotation. Garica took over in the sixth and kept the SeaWolves lineup silent with three no-hit innings. Despite walking one hitter, Garcia whiffed three. Aside from the second inning, Erie did not get a runner in scoring position until the two outs in the ninth inning against Tate Scioneaux . After a close play at first base with two outs resulted in an infield single for Will Maddox, Jake Rogers belted a two-run triple that pulled Erie within three. Scioneaux quickly recovered and struck out the next batter to finish the game. Altoona chased Erie starter Logan Shore (Loss, 0-1) after five innings in his Tigers organization debut. Without issuing a walk, Shore struck out five and gave up eight hits in his first outing since a trade from Oakland in September. Erie reliever John Schreiber fanned five and Trent Szkutnik struck out four to total 14 punch outs for the SeaWolves pitching staff. The series against the SeaWolves continues Tuesday with right-hander James Marvel (1-0, 0.00) taking the hill for his second start of the season. Erie will start left-hander Nick Ramirez (0-0, 0.00). The Curve return to Peoples Natural Gas Field for their home opener and begin a seven-game homestand on Thursday, April 11 against the Akron RubberDucks. Promotional highlights for Opening Week at PNG Field include a special appearance by Pirates broadcaster Steve Blass, Opening Night Fireworks, the first Allegheny Yinzers game and much more. For tickets or more information, visit AltoonaCurve.com, call 877.99.CURVE or stop by the PNG Field box office.